Experienced traders are well aware of the fact that most time-consuming things in trading are not opening and tracking positions but selecting symbols and looking for entry points. Of course, these are not huge issues if you work only with 1-2 symbols. But if your trading toolkit consists of hundreds of stocks and dozens of Forex symbols, it may take several hours only to find suitable entry points. it is to display additional data necessary to make a decision. Initially, we are going to develop the EA on MQL5. However, since many brokers still do not offer MetaTrader 5 accounts, we will re-develop the EA so that it also works in MetaTrader 4 at the end of the article. In this template, we register the timer when creating an EA. Our timer is activated every second. This means the OnTimer standard function is to be called once per second. The only string different from a typical template generated by the MQL5 wizard is #property strict. This string is necessary for the EA to work correctly in MetaTrader 4. Since it does not have a significant effect on MetaTrader 5, we add it to our template in advance. OnChartEvent: response to clicking on graphical objects created on the chart the EA is launched on. All that is done at the beginning of our template, outside of any functions, after the #property block of strings. We can immediately notice that two inputs have a custom type. Therefore, let's add the definition of these types before the inputs. Both custom types are enumerations. A spread exceeding 0.1% of the price is considered increased. Therefore, we will only display symbols having a spread less than 0.1% by default. Thus, the value of the Hide in case of a spread parameter is > 0.1%. But if the list of such symbols provided by your broker is too small, you may choose another value for this parameter. 9 am (or any other value) does not mean that only symbols opening at exactly the specified time are to be displayed. Instead, it means that the symbols that open at this hour (for example, at 9:05) are to be displayed. Accordingly, 4 pm means that only US stock market shares opened at 16:30 are to be displayed. 10 am mostly relates to Russian and European stock market shares. 9 am is an opening time of some indices. Finally, midnight is a Forex market open time since it works round the clock. The comments should clarify why we need these variables. Why do we need a separate function if all can be implemented inside OnInit? All is simple. We will call this function not only when launching the EA, but also when pressing the R key. Thus, we will be able to easily update the list of characters without having to remove the EA from the chart and reopen it. Since the spread is constantly changing, we will have to refresh the symbol list quite often. Besides, the presence of open positions on certain symbols is also changing. Therefore, before using the previously launched EA again, do not forget to update the symbol list (by pressing R) to see the current data. We met two more custom functions: prepare_symbols and show_symbols. The first one forms the array of symbols fitting our conditions. The second one displays the buttons of these symbols on the chart where the EA is running. First, place all symbols into a temporary array. The initial filtering already occurs at this point by the Hide symbols absent in the Market Watch panel input. Placing symbols into the temporary arrays is not necessary. Instead, we can place the necessary symbols into the main list. But in that case, we would need to re-write the code, for example, in case we need to add an input adding only the symbols to be displayed in the list. In other words, we would need to use custom symbols in the necessary order instead of taking all symbols offered by the broker. For the same reasons, a symbol name is first cleared from spaces in the loop that enumerates all the symbols from the temporary array. If you want to implement the input described above, you cannot do without filtering the custom input. Now, let's sort the obtained symbols based on the inputs we have. The code blocks provided below are added below the main filtration of symbols is performed further on comment string of the prepare_symbols function (in the loop of adding symbols to the list). First, check if there is a position on a symbol. If there is no position, check if there is a limit order. If an open position or a limit order is present, skip the symbol. The smaller the spread, the better. From this point of view, it is best to work with symbols having a spread is less than 0.05% of the price. Not all brokers offer such good conditions, especially when trading in the stock market. Of course, it is possible to hide the symbols trading is disabled for without any conditions from the inputs. But you may still want to have such symbols in the list. This is why we add this input. Hide if the market is closed. If you launch the EA on Sunday, you hardly want to analyze a stock market. Most likely, you want to select symbols available on Sunday, like TA25 index or cryptocurrencies. This input parameter allows us to do this. Of course, it would be possible only to display symbols traded today rather than introducing a separate input. But what if it is Sunday and we still want to get ready for the next trading day by selecting suitable shares, etc? Let's implement this ability as an input parameter. I think, this is enough for full filtering by most parameters. But if you need other filtration conditions, you can always add them inside the prepare_symbols function loop. We have already learned how to draw symbol buttons fitting our conditions. We could stop at this point and open charts of obtained symbols manually. But this is inconvenient. Fortunately, we can simplify the process and open a necessary chart when clicking the button. To let the action occur when clicking the button, that action should be described in the OnChartEvent MQL language standard function. The function intercepts any chart event. In other words, it is called at any event happening on the chart. The OnChartEvent function features four inputs. The very first parameter (id) contains the ID of an event that has currently been intercepted by the OnChartEvent function. To understand that the OnChartEvent function was called exactly after clicking a chart button, compare the parameter value with the necessary one. changes the chart scale (I added this feature simply because I use the custom scale rather than the default one). It would be good not only to open a symbol chart, but also to display auxiliary data on it, like description (some brokers make symbol names so incomprehensible that they seem to be some kind of cipher) and symbol movement direction for the last day and hour. This info can be displayed using graphical objects. However, we will use a simpler approach. We will display the info in the chart comments. when pressing X, remove the EA from the chart. As you can see, when pressing R, we simply call the start_symbols function created earlier. We have already learned not only how to show symbol buttons but also how to open charts of necessary symbols when clicking that buttons. However, we are not done here yet. Our utility is still inconvenient to use. After opening a symbol chart, we need to close it manually and click the next chart button. This should be done every time we need to move to the next symbol making the work quite tedious. Let's add symbol list navigation buttons to open charts. We will only add three buttons: to move to the next chart, to move to the previous chart and to close the chart. It only remains to decide how to implement them. We can add the buttons directly in the showcharts function when creating a new chart. But the number of buttons may increase in the future. Creating the buttons and other graphical objects may slow down opening the chart which is undesirable. So far, the buttons added to the chart are just a decoration. Nothing happens when pressing them. Let's instruct them on how to respond to pressing. Unfortunately, the standard OnChartEvent function is of no help to us here, since it reacts only to the events that happened on a chart the EA is launched on, while the buttons are added to a new chart. That's it. As you can see, the amount of the overall code is not overwhelming, while the advantage is evident. We no longer need to open charts and close them repeatedly. Instead, we can click on the necessary button, and all is done for us. Of course, there may be more ways to improve our EA. But in its current form, it is already a full-fledged product that significantly simplifies selection of shares. Now, let's try to move our utility to MQL4. Surprisingly, we only need to re-write a single code block. This will take about five minutes. First, create a new EA in MetaEditor 4. After that, move the MQL5 EA's source code to it. Double-click on the first error to move to the appropriate EA string. 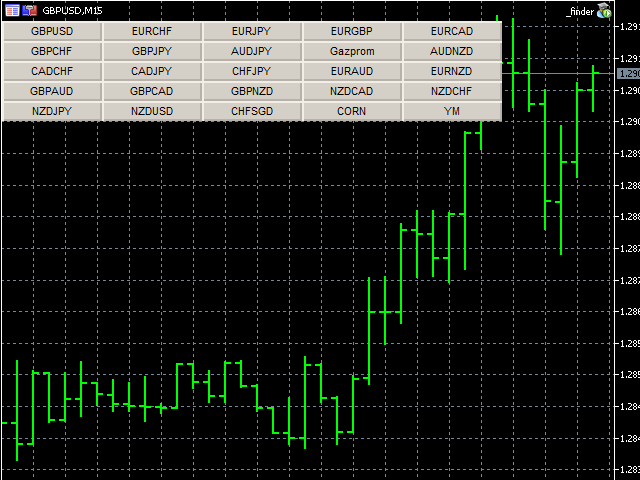 Since MQL4 has no differentiation between positions and orders, the resulting code is much smaller. The remaining errors are fixed automatically since they occurred in the code block we fixed.